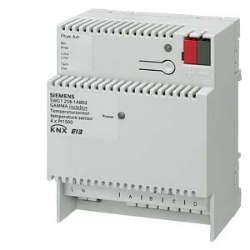 The temperature sensor N 258/02 is a device with a width of 4 module units for DIN rail mounting, with 4 inputs for the direct connection of one Pt1000 temperature sensor per input via a two-core cable up to 50 m long. The device is supplied by mains voltage. It enables the recording and monitoring of up to 4 temperatures in the range ñ35...+145 ∞C. The temperature is measured cyclically per measurement channel (with a fixed cyclic period of 1 s). It can be set via the ETS whether the measured value should be filtered by mean- value generation, whether it should be sent cyclically or event-driven after a change by an adjustable differential value and whether it should be monitored for one or two lower and/or one or two upper limit values. It is ensured via an adjustable hysteresis that a measured value that fluctuates by the limit value does not lead continuously to a coming and going violation of the limit value with corresponding messages.